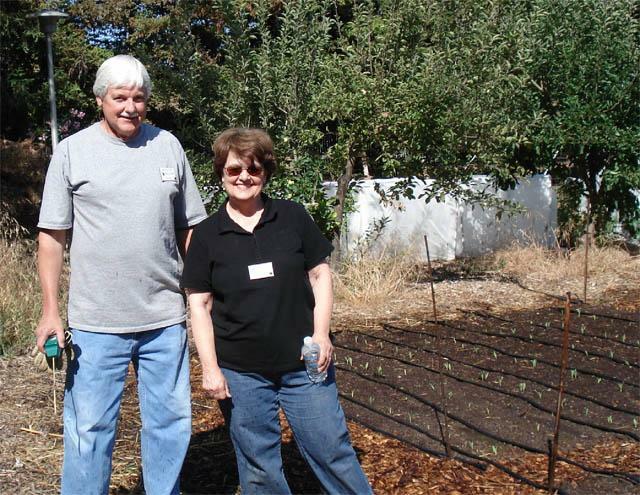 This trial was conducted in the summer of 2008 at our Nine Palms project location (no longer in use). Peaches & Cream corn was reliably productive over an extended harvest period. In 2007 we planted four varieties of corn with different maturation times, but they all matured within a week of each other anyhow, not two to three weeks apart as predicted. So this year we planted three varieties of corn at three and a half week intervals to see if we could get corn to mature at different times over the summer. We also tried four different winter cover crops to improve the soil and see if there were differences in a variety grown in the different cover crop areas. 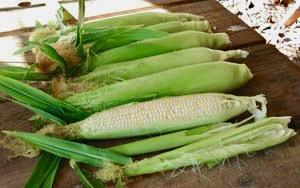 We used three varieties of sweet corn (Latin name, Zea mays). They were standard, not super sweet varieties. Silver Queen is white, Jubilee is yellow and Peaches and Cream is bi-color. See the chart below. The seeding was done using the Earth Way precision seeder. These cover crops were watered with an overhead sprinkler until germination. On November 6, 2007, the mustard and radishes came up. The fenugreek came up later but only sparsely and the clover never germinated even after being covered with row covering material to warm up the soil. 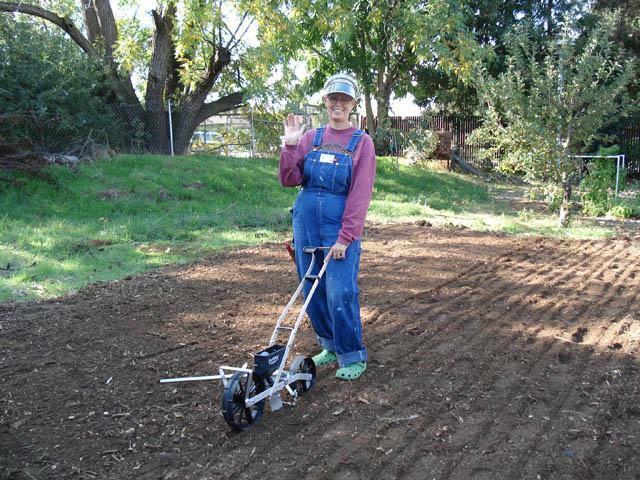 On March 8, 2008, the cover crops were chopped down and rototilled into the soil. The area was thoroughly watered. Over the winter, we discovered that the gophers loved the radishes. I would not recommend using radishes as a cover crop! Another issue was that we had lots of weeds (mostly foxtails) that grew over the winter and had to be pulled out around the cover crops. On May 9th, 2008, the Peaches and Cream seeds were planted directly in the ground in furrows going north-south across the four types of ground covers. Then on June 3rd, Jubilee was planted and finally on July 1st, Silver Queen was planted. Thus, there was a spacing of 3 1/2 weeks between each planting. Each variety had five rows of thirty seeds each so we expected 150 stalks per variety. After initial watering by overhead sprinkler till germination, drip lines were used. The drip lines were on four times per week for 40 minutes each time. None used. Also, no mulch was put down this year. Peaches and Cream came up in just one week on May 16th. There had been some warm days. The plants looked very healthy and there was a very good germination rate. Some of Jubilee came up in a week to 10 days, but the germination was spotty. We replanted in the gaps, about 20 seeds, and eventually, they came up but were never as big as the others. The trees near this plot are getting taller and so the southwest section got shade in the late afternoon. The corn there was not as tall as in other areas. Finally Silver Queen, which had been planted July 1st, germinated on July 8th. Germination was poor. Only about 75% came up and some were stunted. One row was right up against some fruit trees and was probably shaded. On July 29th, we picked eight ears of the Peaches and Cream and tasted them. It was good but not quite ripe. On Aug 5th, we picked 80 ears of Peaches and Cream and then on Aug 12th, picked 97 ears. Finally, on Aug 15th, we picked 40 small ears, mostly from the side stalks. For this variety, not all ears were ready at the same time. We learned to pick by feeling the ear and sometimes peeling back part of the husk. You can’t just go by looks. There were a total of 225 ears of corn! On August 21, we picked 50 ears of the Jubilee for a Master Gardener event, even though some were small. These were cooked and served with butter and salt and pepper. Most people liked the corn but there were a few comments about it not being as sweet as store bought. Most corn now sold in stores or even at farmers markets is all super-sweet and does taste a bit different. Later on Aug 26th, we picked 42 ears of the Jubilee, then a few days later, a few more from side stalks. This variety had a lot fewer side stalks then Peaches and Cream. Total count for Jubilee was 112. The Silver Queen crop was disappointing, probably because it was planted so late (July 1st). On Sept 23rd, we picked 23 ears, then on Oct 3rd, we picked 95 ears. 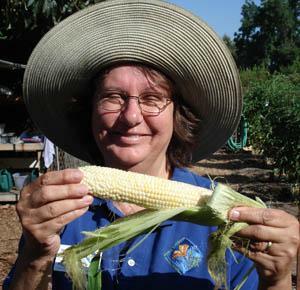 Many of the ears were small and many were not completely filled with kernels. The total was 118. We definitely had corn ripening at different times throughout the summer and learned quite a bit about how to tell when corn is ripe. The Peaches and Cream variety was rated the best. It is touted as having an extended harvest time which was borne out in our trial. We also learned that for some varieties, the side stalks do develop ears even though they will probably be smaller than the main ears. As to the various cover crops, we could not tell any difference between corn grown in mustard, radish or fenugreek (the clover never came up). In 2007 we used a 50 lb bag of alfalfa pellets plus lots of horse manure, which seemed to work better.